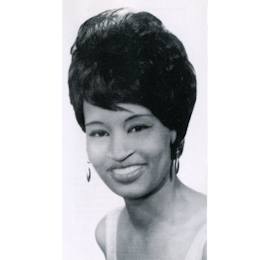 Lorraine "Cookie" Jackson was one of those West Coast R & B singers that I love so much. Her big brassy vocals which featured such a lovely gritty tone really hit the right spot and she nver made a poor record. She started out in the early 60s working with saxophonist Zeke Strong whose band was one of the tightest in Los Angeles. 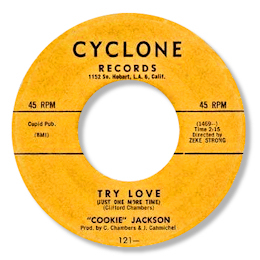 "Try Love" is a simply unstoppable slab of rocking blues – no wonder the dancers can't resist it. Cookie's second release for Zeke's own Progress label "Do You Still Love Me" is very much in the same vein but slightly less dramatic. The flip Blind Love is a first class blues ballad on which Cookie shows that she can sing the downtempo tracks with as much conviction as the up-tempo ones. Her Press single “I Didn’t Lose A Doggone Thing” continues her rich vein of fine swinging R & B, helped by vocal backing from the Flares. The flip “Write A Song About Me”, despite a writer credit to producer Buck Ram, is in fact a dead ringer for Millie’s ska classic “My Boy Lollipop” right down to the horn charts and the harmonica, reputedly played by Rod Stewart on the original. Jackson's Uptown 45s are well arranged by James Carmichael, always a name to look out for on West Coast singles, and despite the claims of dancers who go for "Uptown Jerk" and “Your Good Girls Gonna Go Bad” I like the tuneful mid-pace of "Love Brings Pain" best. 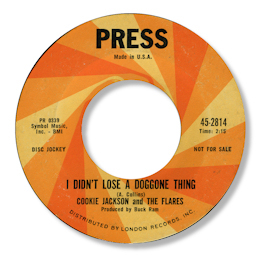 By the time Cookie started working with Larry Williams R and B had given way to soul and on her to Okeh singles there are a couple of outstanding deep soul tracks. Things Go Better with Love was written by Johnny "Guitar" Watson, who was Williams' partner in so many activities both savoury and unsavoury, and is a fine melodic number with a subtle blue tinge to it on which Jackson gives one of her best vocal performances. I think that Fresh Out Of Tears is even better. Williams own song has a superb chord changes and Carmichael deserves a special pat on the back for his beautiful arrangement. The way the horns come in on the second verse to give the number added impetus works very well and the support that Jackson gets from the female chorus is exemplary. Cookie herself is just sensational – full of fire, anger and despair. 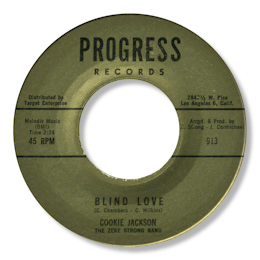 Cookie Jackson's final 45 for Mel Alexander took her back to her roots in the blues and the foot tapping "Need of Love", with it's attractive hookline, was a very good way for her career to finish. But what a shame she didn't carry on through the 70s. 1. The Reena 45 is straight country - Cookie even gets a "twang" in her voice! This was quite deliberate as she has always loved country music and has said that she wanted to become the first black country music superstar! But the 45 is best avoided. 2. “Your good girls gonna go bad” can be found on the Kent UK CD “Okeh A Northern Soul Obsession Vol 2” and “The reason I’m singing (the blues)” can be found on the same company’s CD “Kris Records Los Angeles Showcase Of Soul”. Thanks to Nicci Talbot-Morris for the suggestion.